Scored by Thomas F. Heck for solo violin with classical guitar accompaniment, this collection includes pieces from Volumes 1-3 of the Suzuki Violin School. 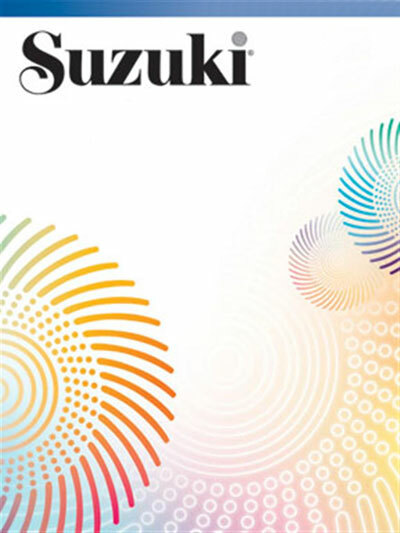 Heck, a guitarist and Suzuki parent, intended the arrangements to serve as interesting alternative accompaniments to the Violin School repertoire. The contrapuntal interest and enriched timbral possibilities of the violin-with-guitar combination result in unusually appealing chamber music performance pieces suited for young musicians. The intermediate to advanced level classical guitar notation is supplemented by chord symbols to enable non-classically trained guitarists to accompany the violin line. Contents are: Twinkle, Twinkle, Little Star Theme and Variations (Shinichi Suzuki) * Song of the Wind (Folk Song) * Go Tell Aunt Rhody (Folk Song) * O Come, Little Children (Folk Song) * May Song (Folk Song) * Long, Long Ago (T.H. Bayly) * Allegro (Shinichi Suzuki) * Three Minuets from Notebook for Anna Magdalena Bach (J.S. Bach) * Chorus from Judas Maccabaeus (G.F. Handel) * Gavotte (F.J. Gossec) * Musette, Gavotte II or the Musette from English Suite III in G Minor for Klavier, BWV 808 (J.S. Bach) * Waltz, Op. 39, No. 15 (J. Brahms) * Theme from Witches' Dance (N. Paganini) * Minuet in G, Wo0 10, No. 2 (L. van Beethoven) * Minuet from Quintet in E (L. Boccherini) * Humoresque, Op. 101, No. 7 (A. Dvorak) * Gavotte (P. Martini) * Gavotte I and II in D from Air for the G String (J.S. Bach) * Minuets, BWV Anh. 114 & BWV Anh. 115 (J.S. Bach).